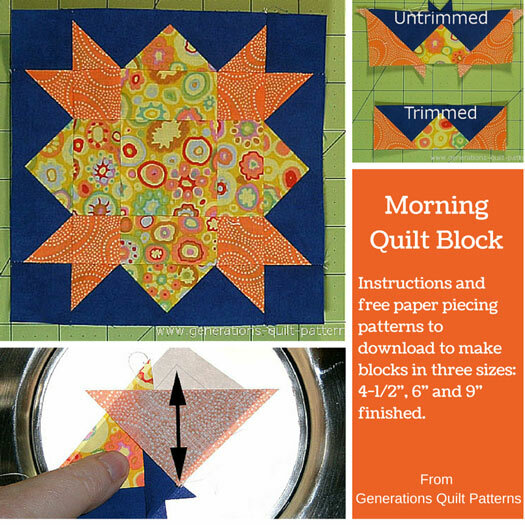 Our Morning quilt block combines both traditional and paper piecing techniques for perfectly pointy points. 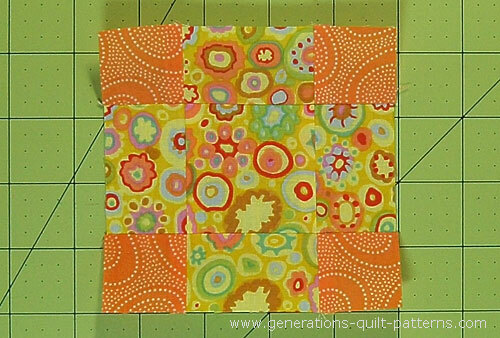 If you can sew on a line, you can make this block. 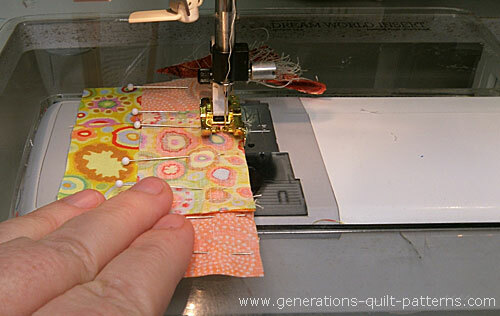 There's ALWAYS more than one way to get things done in quilting! 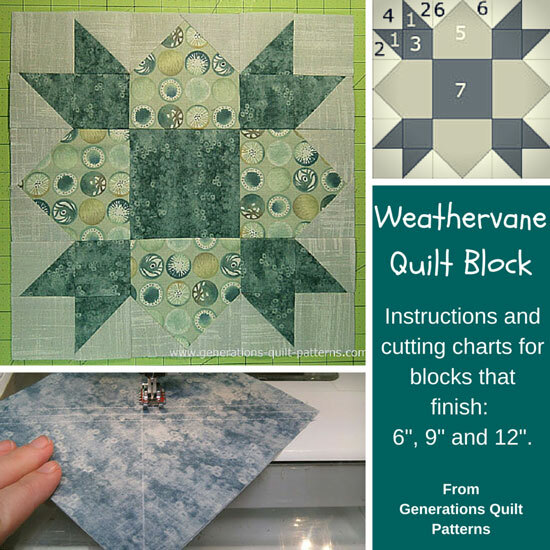 If you'd prefer to skip the paperpiecing altogether, check out the Weathervane quilt block. 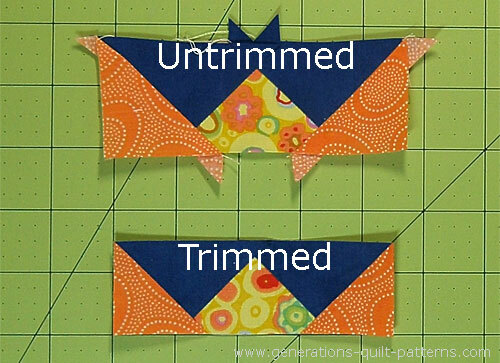 Same basic design—just no paperpiecing! Rise and shine! Morning has broken. I switch between two different presser feet—an open toe applique foot and my favorite quarter inch foot with a guide—as each is best for its particular job. I prefer to use heavily starched quilt fabric. My cuts are more precise; my stitching more accurate. And for paperpiecing, it's 'da bomb' because you can fingerpress so many of your seams instead of jumping up and down to the iron. A great time saver and no sacrifice in quality! 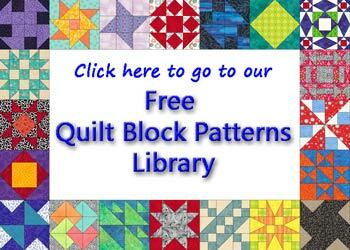 You'll need Adobe Reader installed on your computer in order to open and print the Morning quilt block pattern. You can get it here (a new window opens so you can download it without leaving this page). 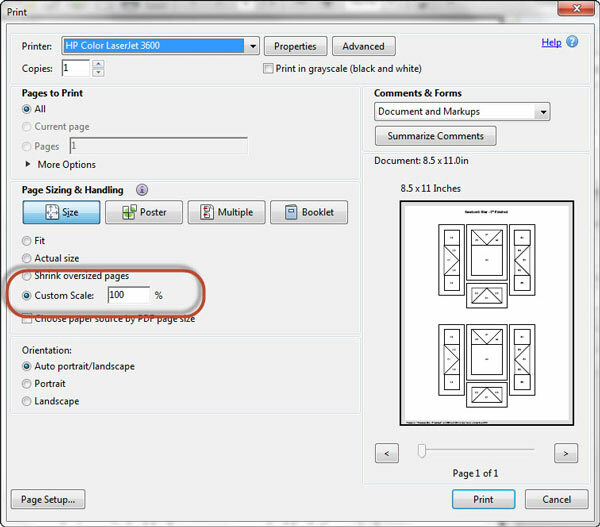 Open the downloaded file, and select the "Print" option. To insure the patterns print at the correct size, under 'Page Sizing and Handling' in the Adobe print menu, set 'Custom Scale' to 100%. Click here to see what it looks like on the Print Menu page. 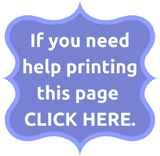 After printing one block, measure it to see that it is correct before making any remaining copies. Choose your 'Finished Block Size' from the table below. 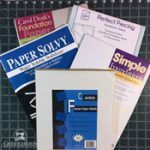 Use the corresponding link for as many paper patterns as you need for your personal use. Cut out each of the four units just outside the dashed line that surrounds it. No need to be particularly neat here. Everything is trimmed to perfection at the end! 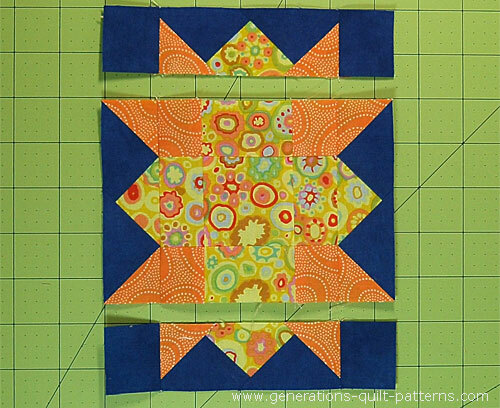 Like all quilt blocks, good contrast between the M(edium), D(ark) and background fabrics is essential for all the pieced parts to show up. Don't forget to subcut patches #4-#6. 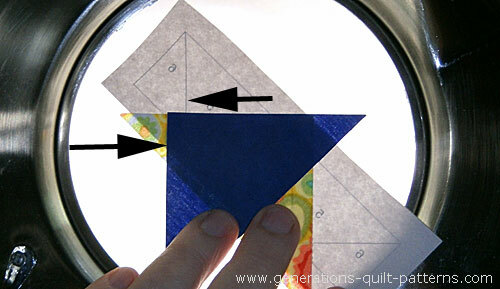 For this paper pieced unit, reduce your stitch length to 15-18 stitches per inch. Install an open toe applique foot if you have one. 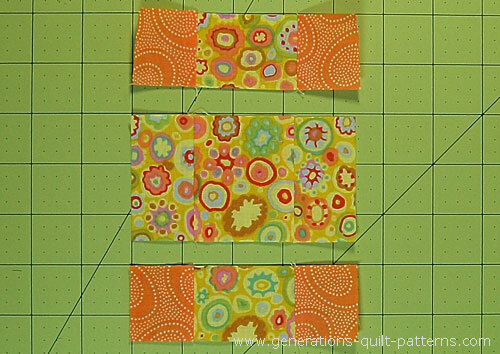 With a dot of Elmer's Gluestick, adhere the back of a #4 to the unprinted side of pattern. Use the dashed guidelines (arrows) to quickly and accurately position the patch. Position the patch so that the adjacent short side extends a scant 1/4" past the solid line between #5 and #6. (see the arrows below) This saves you the step of trimming the SA. Take a second and flip the #5 patch back to make sure it is positioned correctly. Until you're used to piecing this side unit, it has a tendency to look a little backwards. Stitch on the line between #4 and #5, starting and stopping a 1/4" from this line. Stitch from arrow to arrow. Add the second #5 to the other side of the #4, pressing again. If the #5 patches extend more than a 1/4" past the solid line between #5 and #6, trim the SA to 1/4". With RST, position a #6 with the short edge of a #5. For easy placement, the point of the #6 should line up directly with the corner of #6 on the pattern. Don't forget to trim away those dog ears (yellow print) as you see them to reduce bulk. After pressing, trim each of the side units to size. Lay the 1/4" mark of your rotary ruler on the solid outline of the block and trim. Repeat for each side of all four units. We switch back to traditional methods now for our Morning quilt block. 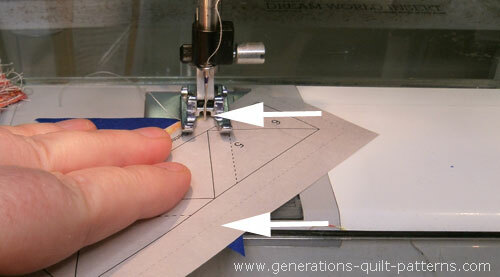 Return your stitch length to what you normally use for piecing. Install your favorite 1/4" presser foot. With RST, stitch a #2 to opposite sides of #1. 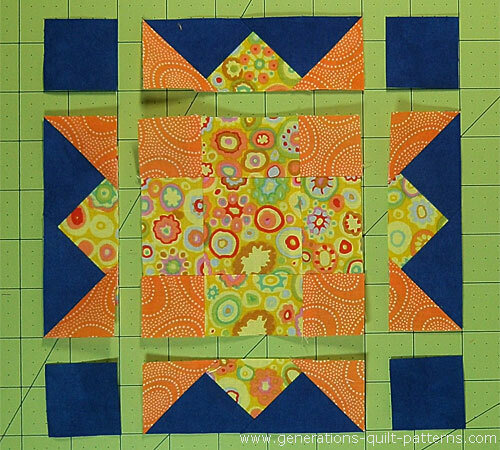 Stitch a #3 to both short sides of the remaining two #2 rectangles. Press the SA away from the #2 rectangles. With RST stitch a #3/#2/#3 to each side of the #2/#1/#2 patch. Pin if needed. Yep! Pinning is in my blood. Press these SA away from the center. Arrange the cut and sewn units as shown below. Stitch the units in each row together, pressing the SA away from all the side units to reduce bulk. Stitch the rows together. I find it helpful to use pins to make sure the valleys of the side units meet the seamline between the #2 and #3 patches. Our Morning block is ready for a quilt! Our Morning quilt block is finished! 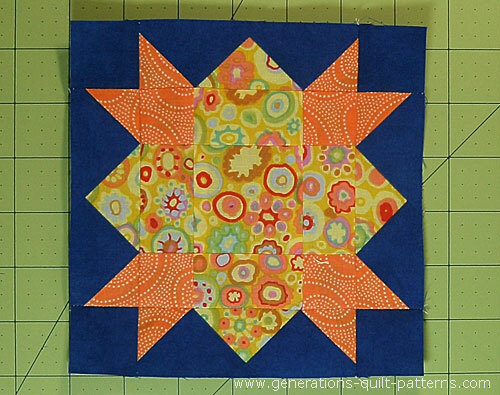 The Weathervane quilt block is a close match to the Morning design, though the patches are quite different. The Weathervane is made from squares—not a triangle in sight. 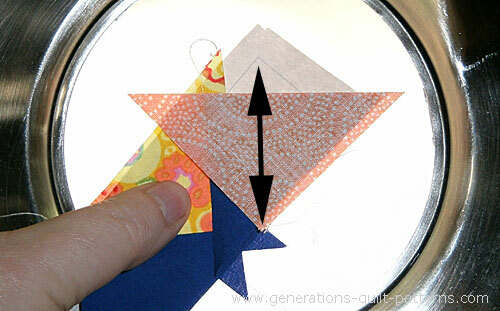 If you prefer to skip the paper piecing, click here to go to those instructions. "Lace Cabins Wintery Quilters' Village"